All the animals listed below are being re-homed directly fron their current home. Borders Animal Welfare Association (BAWA) has NO knowledge of their BEHAVIOUR or HEALTH. IT IS THE RESPONSIBILITY OF THE POTENTIAL NEW OWNER TO ASSESS THE ANIMAL FOR IT’S SUITABILITY, BEHAVIOUR AND HEALTH. BAWA only provides a service by listing the information given by the current owner and passing on phone numbers as agreed. Leo is looking for a new home in the country. He is a lovely friendly cat whose owner is devastated at having to give him up as he is fighting with the other cats in the household. Leo is an intelligent alert and affectionate cat. He loves lying on your lap, dogs and being dried with a towel. His coat does not tangle and is full of character. He stays in overnight and will use his cat litter although prefers to go outside. Leo loves dogs and is used to a cat flap. His owner thinks he should not be re-homed with younger children as he may scratch them when having his tummy tickled as he likes to play. Dino is nearly 5 years old and has lived on the farm most of his life with his owner. Unfortunately his owner was unable to take Dino with him last year when he moved so Dino stayed on the farm. However he is now not good with the sheep and has lost a little weight too, which may be due to him being a bit stressed living with all the other dogs and would therfore prefer to be homed on his own if at all possible. He is a lovely natured dog who really loves attention and I think he would make a very loyal friend. He is currently living in kennels outside but has lived inside too. 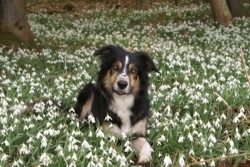 Doogie – an affectionate handsome well trained and obedient 4 year old tri-coloured Border Collie. His favourite past-times are playing ball and swimming. He loves people but would be best placed in a home without young children. He has a great character and is well-loved by all who meet him. He is at present living with his owners but with the arrival of babies in the family they sadly need to find him a happy caring home with new owners who would be firm but gentle with him. He is likely to settle in very easily as has very happily gone “on his holidays” to other people’s homes and even kennels! Because of this he would cope very well with a trial period.